With her win on November 8 looking increasingly likely, Hillary Clinton has been shifting her attention to solving America’s “fun deficit” after this particularly disheartening election cycle. She floated the idea of a “big national dance” and suggested that people make more time for cat GIFs, but on Thursday she finally found something that can unite Americans from across the political spectrum: speculating about Joe Biden being her secretary of State. Neither Clinton, nor her aides have yet told Biden. According to the source, they’re strategizing about how to make the approach to the vice president, who almost ran against her in the Democratic primaries but has since been campaigning for her at a breakneck pace all over the country in these final months. “He’d be great, and they are spending a lot of time figuring out the best way to try to persuade him to do it if she wins,” said the source familiar with the transition planning. Maybe leak the news to some media outlet and see how he responds? Biden served as a member and chairman of the Senate Foreign Relations Committee for many years, and he has been one of President Obama’s closest advisers on various foreign-policy issues. The vice-president already has relationships with leaders around the globe, and selecting him would signal continuity between the new Clinton administration and that of her popular predecessor. 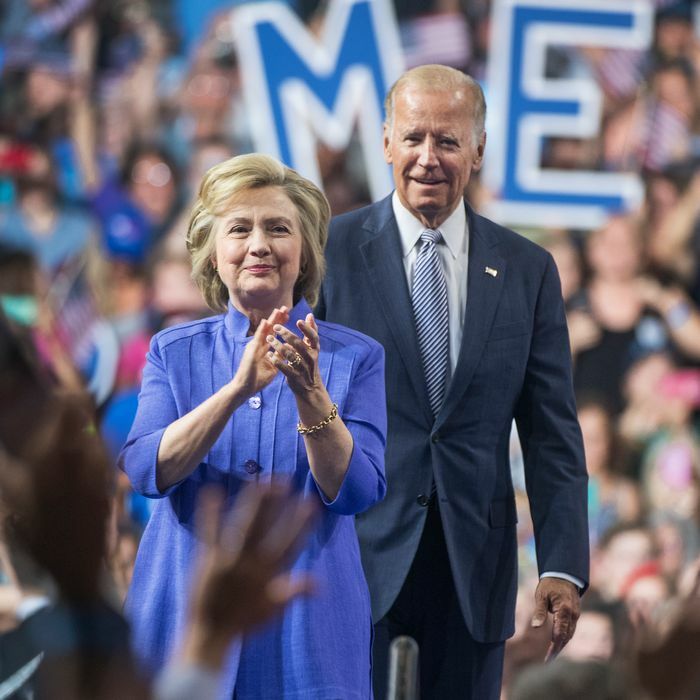 Plus, leaked emails from the Clinton team confirm that they were concerned about a primary challenge from Biden; appointing her former rival would be reminiscent of Obama’s bold, Lincoln-esque pick for secretary of State. But she’d also be choosing someone with whom she repeatedly clashed as secretary of state, with the vice president often playing the skeptic while she supported more aggressive action. They differed over leaving troops in Iraq, the surge in Afghanistan, and whether to arm Syria’s rebels and bomb Libya — and Clinton took the more hawkish line in every case. During the Obama administration’s lengthy review of Afghanistan policy early in his tenure, for instance, a skeptical Biden urged the president not to escalate the war, while Clinton backed Gen. Stanley McChrystal’s request for 40,000 more troops. It’s easy to imagine Clinton having serious reservations about Biden serving as her secretary of State, but there’s absolutely no down side to floating the possibility ten days before the election. Democrats may be energized by the prospect of one of the party’s most popular figures joining the Clinton administration, and the same cannot be said of other names on her reported short list (sorry, ’90s Deputy Secretary of State Strobe Talbott). The story also serves as a positive distraction from the slow drip of John Podesta emails coming from WikiLeaks. And there’s no reason to worry that the rumor will spark a nasty attack from Donald Trump; he and Biden are already talking about physically fighting each other, so how much worse could it get? The report of our gaffe-prone vice-president potentially becoming our gaffe-prone secretary of State is the strongest evidence so far that Clinton can actually heal our divided nation. In just a few hours, the report has already sparked gleeful derision on the right and delight on the left. A man who can bring endless joy to the internet by merely finding two quarters on the sidewalk is better than a whole basket full of cat GIFs.